Sometimes, you just want to hate a place. Especially a place you’re convinced has been ruined. I had this mind after agreeing to lead a session on design at RTPI London’s Summit on ‘Growing up in the suburbs’. A useful topic in itself, germane to London’s ability absorb a growing population… and I know a little something about the subject. 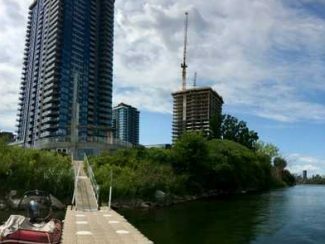 I grew up in what may be among the most aggressively ‘intensified’ suburbs in North America – Nuns’ Island, which sits just off the Island of Montreal in the middle of the St. Lawrence River, in Quebec, Canada. Architecture buffs may have heard of the place, but that’s probably it. The 3.75 sq km island was opened to development in the 1950s after what some called the deal of the century: an eccentric developer paid the nuns of the Congrégation de Notre Dame – which had owned the isolated island as a farm and retreat since the 1700s – C$5,000, built media buzz and wrote letters from fictitious islanders urging the Canadian government to reroute a planned highway bridge via Nuns’ Island (saying expropriations would cost less…). He walked away with C$2m profit, and the idyllic retreat was gradually eroded. Development has come in spurts and waves, but began with a forward-thinking masterplan in the 1960s. For my (parents’) money, an ideal place to grow up. Montreal was much more of an economic and cultural power before Quebec attempted to secede from Canada (Brexit spoiler). 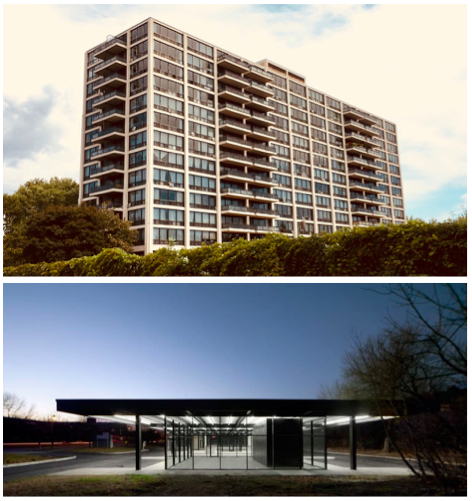 The city hosted a world Expo in 1967, and in keeping with that global ambition, architect Ludwig Mies van der Rohe was brought in to design key elements of the new neighbourhood, including three high-rise apartments that have aged very well, and an iconic gas station. We were that cool. My family moved into the first phase in 1969; these were quadrants usually featuring two four-storey apartment buildings and two sides of terraced townhouses. They were all for long-term private rent, and the core of the development is still owned and rented out by the original management company. The model can work. 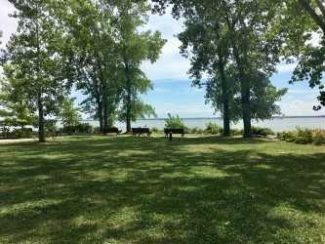 Mature trees were left in each square, a golf course doubled as cross-country ski trails, and the mighty St Lawrence was accessible via tended paths or ancient woods. The population of 3,925 (1971) focused on a community centre with shopping, recreation centre, playing fields and library. The Mies van der Rohe high rises were considered huge at 13 storeys, but we didn’t know who he was and the famous gas station was no big deal to local kids. The school only went to the third grade, but it was a minor sacrifice to be able to run around in the woods so close to a major city. So far, so many similarities with quality 1960s/’70s masterplanned suburban developments in the UK and the world over. Still, my perception of what followed broke my heart and made me go back for a poke around while visiting Montreal this summer. When my family split up, we moved to a newer, lower-quality build in a further part of the island, and after leaving for Montreal proper, other parts of Canada and then the US, I watched with dismay or disgust as buildings with little inherent design quality and no overall harmony sprouted up in one and then another boom, with patches of bare landfill and stalled construction during the repeated bouts of bust years in between. As of 2011, Nuns’ Island’s population was 18,315 – from 1986 to 1991 alone, the population rose 44%. 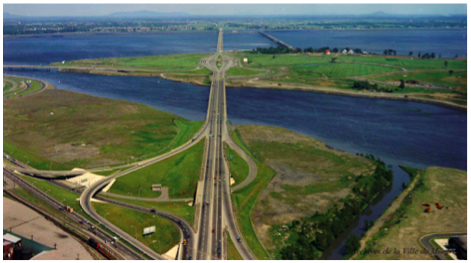 As with many transport-dependent suburbs, outsiders tend to see Nuns’ Island – or Île des Soeurs – from a distance, in this case the highway bridge that enabled and now bisects the place (See FoL’s related work on barriers). This is at the most commercial and ugliest end of the place, so on last month’s visit I resolved to head into the island proper to see what it was like, honestly more to hate it with evidence than to give it a fair shake. I spent a few hours touring with a friend who’s lived there for years and it’s just – ordinary. 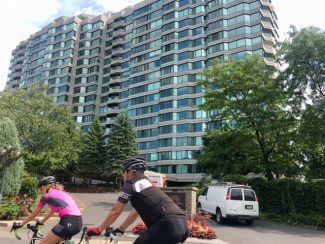 There are two assisted-living buildings, a range of purchase and rental apartments and houses, and lots of condos for overseas investors. There’s a patch of woods left, a replacement 9-hole golf course over new construction fill and the community centre has a church, mosque and temple all together. The photos below are from 2018. There is some unimaginative design on the island, less open space than before, too little local transportation, and if you only see it from the bridge, it’s a bit blah. 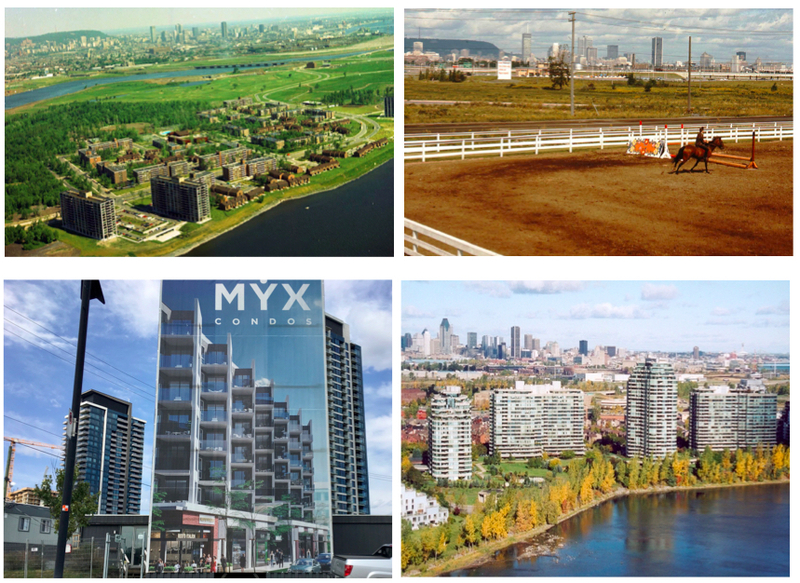 But there’s still a lot of parkland, good bike trails and decent (some quite well-made) housing for about 20,000 people at varying income levels, with more to come. If developers and the city can resist taking it all to the very shoreline, it will be fine. Not what I grew up with, but fine. 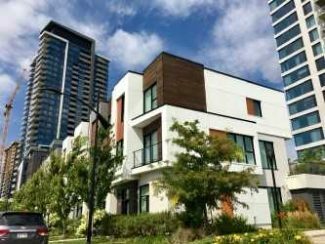 I’m not suggesting that people facing change – especially plans for first-in-area towers or serious massing – just take whatever’s put in front of them without asking any questions, but cities are meant to evolve, and with some care and attention, a new suburban form doesn’t have to be a disaster.